This family-friendly Scottsdale resort is located in the mountains, within 2 mi (3 km) of Butterfly Wonderland, OdySea Aquarium, and Salt River Fields at Talking Stick. Old Town and Scottsdale Fashion Square are also within 6 mi (10 km). 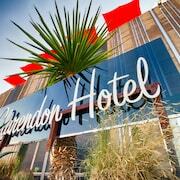 Located in Encanto, this hotel is within 3 mi (5 km) of Encanto Park, Grand Canyon University, and Heard Museum. Phoenix Art Museum and The Van Buren are also within 3 mi (5 km). Hotel Valley Ho in downtown Scottsdale is less than a mile from Scottsdale Convention Center, Fashion Square Mall, and the Waterfront. The Desert Botanical Gardens and Phoenix Zoo are 3 miles away. 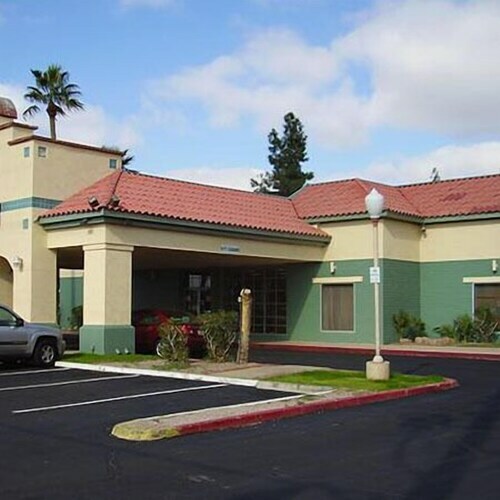 Located in Downtown Phoenix, this golf motel is within a 10-minute walk of Comerica Theatre, Phoenix City Hall, and Orpheum Theatre. Arizona State University - Downtown Phoenix and Patriots Square Park are also within 15 minutes. Van Buren - 1st Ave Station is 6 minutes by foot and Jefferson Street - 1st Ave Station is 10 minutes. 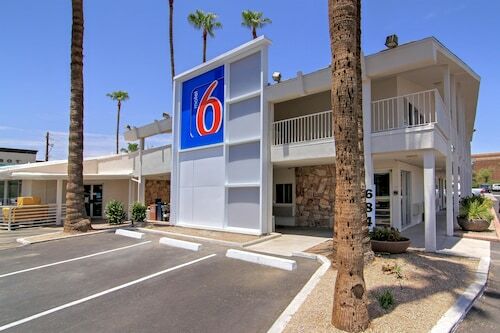 Located in South Scottsdale, this motel is steps from Scottsdale Fashion Square and Old Town. Scottsdale Waterfront and Scottsdale Stadium are also within 2 mi (3 km). 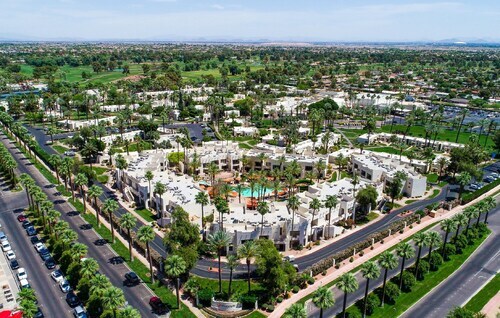 This 65-acre, upscale resort is a half-mile from the Tournament Players Club of Scottsdale and within 3 miles of Kierland Commons shopping district, Westworld, and Scottsdale Municipal Airport. 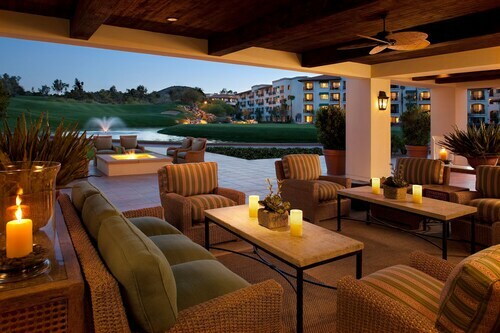 Old Town Scottsdale is 14 miles away. Located in the scenic foothills just outside Scottsdale, Boulders Resort & Spa, Curio Collection by Hilton offers the perfect location from which to explore the rock formations and desert scenery of the Sonoran Desert. Built in 1918, this luxury resort is surrounded by gardens and citrus trees, 2 blocks from Litchfield Park, 5 miles from Wildlife World Zoo, and 18 miles from downtown Phoenix and Phoenix Convention Center. The resort is also in close proximity to the University of Phoenix Stadium, home of the Arizona Cardinals. How Much is a Hotel Room in Phoenix? 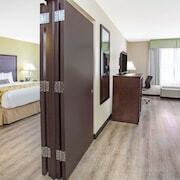 Hotels in Phoenix start at C$69 per night. Prices and availability subject to change. Additional terms may apply. With endless expanses of sand reflecting the sun’s light, and towers of red rocks punctuating the horizon, the alluring Arizonan desert is a destination unlike any other. And as the state’s most populous city, Phoenix has an incredible amount of attractions to offer, regardless of how you like to spend your time. If you plan on taking a trip this spectacular Southwestern city, the hotel you choose could make all the difference. There is a huge variety of places to stay while visiting the Valley of the Sun. 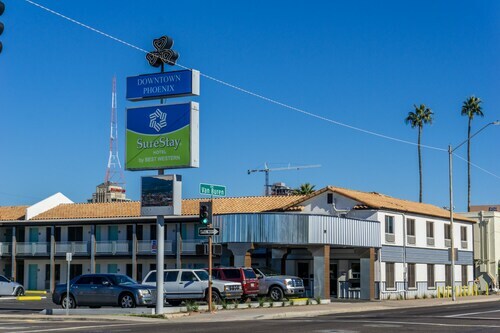 Yet based on what you brings you to the city, you might find one Phoenix lodging option more to your liking than another. Depending on how you plan on spending your time in Arizona, here are some of the city’s best accommodations. Arizona Grand Resort: How many Phoenix hotels do you know of have their own on-site water park? Accessible exclusively by guests of the Arizona Grand, the 7-acre Oasis Water Park is considered one of the country’s best sites for aquatic amusements. Inside you’ll find a lazy river, an enormous wave pool, and an eight-story tower with three separate water slides. And whether you’re traveling alone, alongside your sweetheart, or with the whole family in tow, a private cabana can take your Oasis experience to the next level. And when you’re ready to dry off, the Oasis Bar & Grill is the perfect place to grab a drink or chow down while watching others have fun in the water. Pointe Hilton Tapatio Cliffs Resort: If you’re in town for tee-time, the Pointe Hilton at Tapatio Cliffs is a golfer’s dream come true. Located just yards from the greens of Lookout Mountain Golf Club—one of top-rated golf resorts in America—this hotel offers incredible views of the Sonoran Desert and the surrounding Phoenix North Mountains. Golfers of any experience level can benefit from the Hilton’s helpful Golf Academy, which has seasoned pros on staff to help first-timers learn the fundamentals and veteran players fine-tune their game. Both individual and group lessons are available, and the hotel offers a variety of “stay and play” packages to align with the time you spend on the links. Guests even save 10 percent when the purchase a round of golf. Pointe Hilton Squaw Peak Resort: With three excellent on-site eateries, Pointe Hilton Squaw Peak Resort is among the best places to stay in Phoenix for those who consider themselves foodies. If tickling your taste buds is on your agenda in Arizona, here’s a glimpse at this resort’s restaurants. Hole in the Wall: This landmark, Old West-style eatery offers exquisite Southwestern meals that make it a favorite of many Phoenicians. Occupying an authentic ranch house built in the 1940s, the restaurant has two sprawling patios and a sunken bar adjacent to the hotel’s River Ranch. Be sure not to miss the morning breakfast buffet that includes more than a few made-to-order menu items. Slim Pickens: Aside from offering incredible libations in a lively atmosphere, this poolside watering hole also serves up grilled fare that you can chow down on as you keep an eye on the action. Rico’s American Grill: Set amid a gorgeous garden along the happening 16th Street scene, this alfresco restaurant invites guests to try an impressive assortment of locally-sourced meals including staples of the Southwestern diet. Perhaps most impressive, though, is the selection of tequilas and signature margaritas to tickle your tongue. 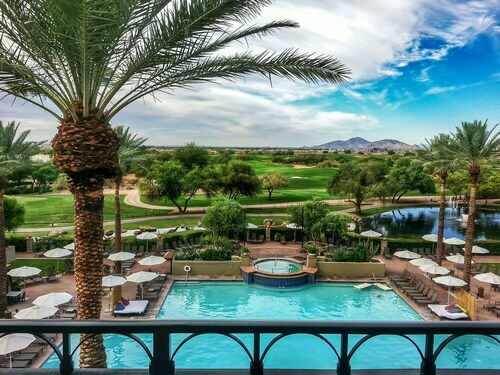 JW Marriott Camelback Inn Scottsdale Resort & Spa: Take some time to focus on yourself at this sumptuous retreat, which helps guests look and feel younger, while bringing them closer inner peace. 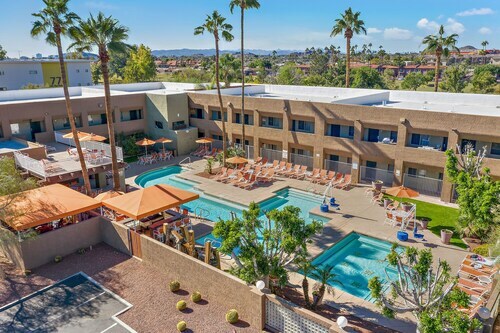 This top-of-the-line resort might not be actually located within the city limits of Phoenix, but at only about a dozen miles away, Scottsdale’s Marriott Camelback Inn is worth the quick drive it takes to get there. Here you’ll find a vast, 125-acre escape that instills in you a sense of serenity while staying in the Sonoran Desert. Relax amid resplendent surroundings of the hotel’s casita rooms, and make the most of the full-service spa, heated outdoor pool, and abundance of nearby adventures just outside your door. Travelocity makes it easy to reserve cheap hotels in Phoenix at any time of year. Our intuitive booking system lets you lock down the room of your dreams at these four destinations, or any of the other hotels in Phoenix. Book a stay with us today, and your dreams of the desert will come true before you know it. Location next to University and the staff is very good. I had an extra sleeping area with a 📺 There was also a laundromat available for me to wash my laundry.My twins enjoyed the pool.I really didn’t like the complementary breakfast..I needed more breakfast selections. Property rundown and unclean on the outside. Checked in late at night & lighting was dim around the property. Location to the airport was key. Very grateful for shuttles to/from airport. Staff extremely friendly and service-minded. This is the BEST hotel EVER and I have traveled all over the country and the world! The staff is top notch (Especially Tom M.) and the amenities are great!